UCLA Kyodo Taiko will perform at the 45th annual Manzanar Pilgrimage, sponsored by the Manzanar Committee, scheduled for 12 p.m. on Saturday, April 26, at the Manzanar National Historic Site, located on U.S. Highway 395 in California’s Owens Valley, between the towns of Lone Pine and Independence, approximately 230 miles north of Los Angeles. Each year, over 1,000 people from diverse backgrounds, including students, teachers, community members, clergy and former incarcerees, attend the pilgrimage, which commemorates the unjust imprisonment of over 110,000 Americans of Japanese ancestry in ten American concentration camps, located in the most desolate, isolated regions of the United States. Manzanar was the first of these camps to be established. UCLA Kyodo Taiko, the first collegiate taiko group in North America, was founded in 1990, and made its debut in 1992 at the opening ceremony of UCLA’s commemoration of the 50th anniversary of the internment. Led by 2013-14 directors Kayla Asato and Eric Briggs, UCLA Kyodo Taiko is composed entirely of UCLA students. They have performed annually at local K-12 schools, Nisei Week, Los Angeles Tofu Festival and the Lotus Festival in Los Angeles, the Intercollegiate Taiko Invitational, during halftime at UCLA basketball games, as well as the first annual USA Sumo Open, in addition to many other campus, community and private events. 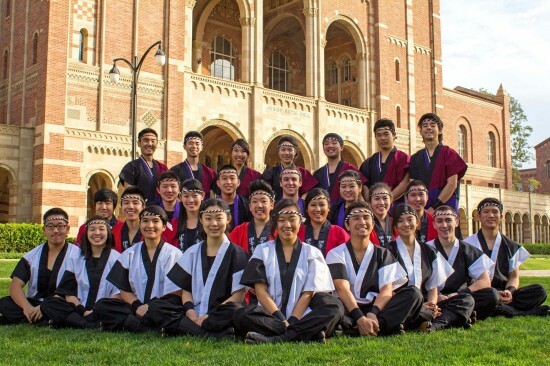 UCLA Kyodo Taiko has also become a fertile training ground for those who wish to continue with taiko after their college careers end, as many alumni have become members of professional taiko groups, including Nishikaze Taiko Ensemble, TaikoProject and Progressive Taiko (Prota). The afternoon pilgrimage program will feature speakers, including keynote speaker Professor Eileen Tamura of the University of Hawaii, the traditional interfaith service, and ondo dancing. The Sue Kunitomi Embrey Legacy Award will be presented to Dr. Arthur Hansen of CSU Fullerton and educator Mas Okui. In addition to the daytime program, the popular Manzanar At Dusk program follows from 5 to 8 p.m. at the Lone Pine High School auditorium, located at 538 S. Main St. (U.S. Highway 395), in Lone Pine, nine miles south of the Manzanar National Historic Site, across the street from McDonald’s. Manzanar At Dusk is co-sponsored by the Nikkei Student Unions at Cal State Fullerton, Cal State Long Beach, Cal Poly Pomona, UCLA and UC San Diego. Through a creative presentation, small group discussions, and an open mic session, Manzanar At Dusk participants will have the opportunity to interact with former incarcerees and/or their relatives, and discuss the relevance of the camp experience to present-day events and issues. The Manzanar Committee has also announced that limited seats are still available on the bus to the pilgrimage from Los Angeles. For further information, or to make a reservation, call (323) 662-5102, or email [email protected] The non-refundable fare is $40 general, $30 for students and seniors. Complimentary fares are available for those who were held at any of the U.S. government confinement sites during World War II. Pilgrimage participants are advised to bring their own lunch, drinks and snacks as there are no facilities to purchase food at the Manzanar National Historic Site. Water will be provided. For more information, go online to http://blog.manzanarcommittee.org, call (323) 662-5102, or email [email protected] You can also follow the Manzanar Committee on Facebook (www.facebook.com/ManzanarCommittee) and Twitter (http://twitter.com/manzanarcomm).